Microsoft (outlook.com) like Yahoo and Google offer free and paid email services. The free email services are suitable for personal use, and are advertiser supported. You can upgrade to the Ad free Outlook.com service for around $20/year to remove the ads, and have an account that doesn’t expire. Outlook.com is the latest version of Microsoft’s free webmail service which started with Hotmail (domain hotmail.com). When you sign up for a new account you can use any of these domain names for your email address. Go to www.outlook.com which will probably redirect you to a new page where you can login to your email if you already have one. You should find a create new account link on the page. Click the link and fill out the new account form. When it comes to entering a desired email address most people will be disappointed to find that their preferred option is usually already taken. I prefer to use meaningful names like johnbloggsmail@, jbmail@ joebmail@. If you have a middle name try using the middle initial e.g. joe.w.bloggs@. Flirty or immature addresses e.g sexysue66@outlook.com – As this video shows these are very unprofessional and embarrassing. Misspelled names e.g. jhnobloggs@outlook.com These look terribly unprofessional and are incredibly difficult to remember. Spaces, underscores e.g. john bloggs@outlook.com and john_ bloggs@outlook.com – Spaces aren’t allowed by many systems, and spaces and underscores make addresses difficult to remember. Meaningless Names e.g. upagumtree@outlook.com – Again terribly unprofessional and are incredibly difficult to remember. You can also access your email using desktop based email clients like outlook/outlook express using POP3 and IMAP4, as well as by mobile phone Apps. When you create a new outlook.com email account that account can be used to access other Microsoft services like Onedrive,Skype and Messenger. Microsoft uses a variety of security mechanisms to protect your account, and you will usually be required to verify your identity before you can make changes to your account settings. This means that someone with access to your email account, and password will not be able to change the password associated with that account, and lock you out. 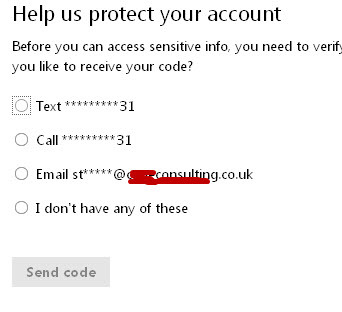 The screen shot below show the security screen I go to when trying to change my email aliases while logged into my outlook.com email account. You can disable this extra security screen for trusted devices by clicking the I sign in frequently on this Device.Don’t ask me for a code check box. Because you don’t normally make many account changes once your account is setup I wouldn’t disable this security feature. There is also a security procedure known as two step verification which operates the same as the extra security check described above, but it operates when you sign into your account, and not just when you try to make account changes. 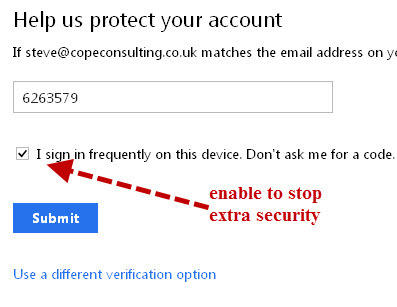 With two step verification enabled each time you sign into your email you will need to get, and then enter a verification code. Some devices don’t support this type of verification, and I find it too troublesome to operate, but if you are very security concious it is worth considering. 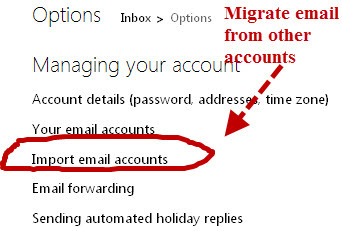 Outlook.com provides an import email facility to allow you to easily migrate email from Google,Yahoo and other email accounts. I tried to migrate a Yahoo account about 5 times, but each time it was unsuccessful. However Gmail migration worked very well. Go to inbox>Options and select import email accounts and select your email provider from the list.